The financial crisis has acquainted Europe with a common pattern which consists in the rapid rise of protest parties challenging the established political systems. The basic and novel feature of their approach is the aggression shown the European Union and the vehement rejection of the various proposals for rescuing the euro. Populism looks very like a new specter haunting European democracies, and as such causes serious concern. Unfortunately, the growing concern does not coincide with policies aimed at finding viable solutions, as the center-right parties and governments believe that the only solution to the crisis is to adopt austerity measures and Social Democrats have not yet found effective alternatives. We want to focus on the modern manifestations of this phenomenon, and take as our definition Frank Decker’s concept that populism is a strong stand against the status quo, appealing to lower social groups and a phenomenon of the social crises of modernization, using simplified shapes and models of analysis. In other words, a key feature of populism is the Manichean method of addressing problems and a black and white way of thinking about history. According to this type of analysis, diversity, complexity, relativism, uncertainty, doubt, pluralism, rational arguments and rationality should not exist. The rhetoric is addressed bluntly to a collective “we”. In particular, stereotypes and views of traditional roles are deployed to maximum effect on a significant part of the population who feel insecure. According to Decker, populism and modernization are nearly the same thing. A different approach, introduced by Ernesto Laclau, identifies “the dichotomy of the social field between privileged and underprivileged as a key feature of populism either from the left or the right of the political spectrum”. Populists claim the support of the disadvantaged in order to subvert the existing political system. In the concept of “people”, according to this logic, only the non-privileged section of the society seen as bearing the “ultimate virtue” is recognised. The enemy - friend figure, once introduced by Carl Schmitt, revives a strange bipolarity. On the one hand is the nation, the people, the underprivileged, our own, and on the other, the enemies of the nation, emigres, foreigners, the privileged, the moneylenders. This is accompanied by a strong willingness to see institutions as obsolescent which ultimately legitimizes lawless behaviour. According to Laclau, populism tends to prevail historically, “when a large number of social and economic demands accumulate, which cannot be satisfied within the existing institutional system”. Because populism is always addressed to the disadvantaged, any political programme aimed at empowering marginalized social groups contains populism to a certain extent. Furthermore, Laclau believes that “in every political system, two standard political processes exist. In the first, which is defined as populist, there is a widespread mobilization of masses based on the ‘equivalence logic’. In the second, which is defined as institutional, individual demands of specific social groups are dominant, which are implemented selectively by policy practitioners, based on a logic of difference”. In every political system, these two processes coexist, but in different proportions. According to Laclau, Greece during the widespread redistribution period of Andreas Papandreou (during the 1980s) was an example of the first, while the second is exemplified by the modernization period of Costas Simitis (1996-2004). The first is populist, and the second institutional, but one may dominate without necessarily eliminating the other. We could also refer to the work of Cas Mudde and Cristobal Rovira Kaltwasser who distinguish three interdependent features of populism. These are primitivism (a weakened form of nationalism), autarchy and popular sovereignty. Right wing populists often invoke the overthrow of popular sovereignty in order to accentuate the catalytic effect of migration while with the same concept, leftist populists emphasize the dissolution of the nation state as a result of the memorandum imposed by the International Monetary Fund, the European Central Bank and the European Commission. Populism appears in democratic regimes, flourishing through the strong denunciation of its policies. In the majority of cases, solutions proposed by parties that trade in this rhetoric are inapplicable, but presented as the only alternative, particularly in the impasse posed by the economic crisis. As Margaret Canovan suggests, “populism in modern democratic societies can be described as an invocation to the ‘people’ versus the existing power structure and the prevailing attitudes and values of society”. It is obvious that the factors that favour the emergence of populists in Greece have found fertile ground during the last four years due to the economic downturn. Economic disparities that continually expand a decadent political system and frustration with the traditional political forces quite unable to implement effective policies that will offer real solutions to the problems plaguing the middle and lower social groups, have caused the rise of populism and political extremism. The increase in both poverty and inequality has inspired populist political discourse, leading to the rise of support for both left and right populist parties such as “Golden Dawn” and SYRIZA (Radical Left Party). Their political discourse aims at convincing people that they offer the only solution to the economic crisis and in addition, Golden Dawn tries to attract votes by citing the expulsion of immigrants as a solution to several problems. For modern populists, a key supranational theme for political mobilization is European integration as a perpetrator of abstract globalization. On this key aspect, there is a remarkable coincidence of views between the left and right tendencies. In Greece, both call for the return to drachma despite the fact that its current value is only 0.00293 euros. Anti-European left parties such as Theodoros Katsanevas’ ‘Drachma’ and Alekos Alavanos’‘Plan B’ have already been launched and together with the neo-Nazi ‘Golden Dawn’, all record rising pecentages in recent polls. A new, inclusive right wing platform, ‘Independent Greeks’, is attempting to collect votes from all poles of the political spectrum purely by using the attractions of such populist policies, while Golden Dawn has also realised that Nazi views are not so popular, deploying “Hellenophilia” as a more effective form of propaganda. 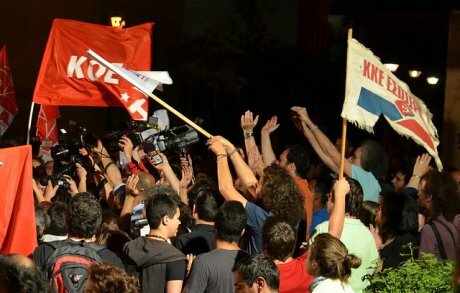 There are also some constituent parts of the Syriza alliance, such as the ‘Internationalist Labor Left’, which call for the Greek government to default on both local and international loans, for the banks to be nationalized under public-democratic-labor control and for heavy taxation to be introduced on businesses and higher income groups. Furthermore, it proposes “insubordination on European Guidelines, decisive escalation of social unrest, systematic cultivation of relations with the left and resistance movements throughout Europe, seeking the overthrow of capitalism on a national and European scale”. Slightly more muted in tone is the “Communist Organization of Greece” which supports the country’s exit from the Eurozone. Syriza overall manifests some unevenness and uncertainty around the whole approach to European Union. The ostensible commitment of its leadership to the European vision is accompanied by statements such as, “the euro is not a fetish”, while on the other hand, the internal opposition of the left constituencies calls for the creation of a left government together with the Greek Communist Party (K.K.E.) for the purposes of an anti-capitalist left cooperation which rejects any creation of an institutionally unified Europe under capitalist conditions. Here again in Syriza we can clearly observe the contradictory pulls of the populist and institutional policy templates as pointed out by Laclau when they appeared in PASOK (the Panhellenic Socialist Movement) during the mid ‘70s and ‘80s. Indeed, anti-Europeanism is gradually spreading throughout Europe as the US research institute, the Pew Research Center reports. The percentage of Europeans who have a positive view of the European Union is now at a record low of 45%. The research, conducted in eight countries including Greece, also shows that economic crisis is now systemic and has struck a serious blow against the credibility of the European Union. As stated in the report, “The European Union is the new sick man of Europe”. In particular, the effort during the last half century to create a more unified Europe is now the main victim of the euro crisis. Beyond the democratic deficit and the lack of political representation that has tarnished the image of the European Union, an even stronger negative opinion increases as a result of Europe’s unending economic crisis. Despite the fact that a large part of the European population is opposed to the budget cuts applied in order to balance the deficits and to tighten monetary policy in fear of hyperinflation, they have no power to alter that course. Unfortunately, the necessary democratic and civic tools for such a change of direction are totally lacking. A developmental shift in countercyclical policy to counter the general conditions of recession and rising unemployment will take far longer to implement. This fact is well understood by many Europeans who see that none of the options in the European elections is going to change the Eurozone’s macroeconomic policies and the existing technocratic management of the crisis, since the European Parliament, the only EU institution that has direct popular legitimacy, has not the slightest power to modify or challenge the implementation of austerity measures. The direct effect of the current policies, which ignore a clear social majority both in the south and the north of the EU, is the rise of euroscepticism even in countries that traditionally were considered too pro-EU, such as Greece. Due to the pervasive dissatisfaction arising from austerity measures, the new composition of the European Parliament after the elections in 2014 is expected to be rather different. It is estimated that the number of anti-Europeans and Eurosceptics will increase from around 100 to around 200 MEPs in a total of 751 seats. This changing composition of the European Parliament will reinforce the presence of radical parties, and reduce the number of European social democrats and People's Party MEPs below 400 seats regarded as a psychological threshold. Anti-EU parties in Greece and other European countries are already recording very fast growth. The anti-European ‘UKIP’ (United Kingdom Independence Party) in the United Kingdom poses a big problem for British Prime Minister David Cameron. In Finland the party of ‘Finns’ and ‘Stronach’ in Austria record a significant increase in support. The latter warns darkly that the decline of Europe can only be solved by the introduction of national euros for each country, with German euros as the guiding euro currency. On the other side, there is the example of the left social democrat Oskar Lafontaine, who proposes, as an exit from the European crisis, the return to the European Monetary System (EMS), ie the return to national currencies and their coupling. His proposals have caused much debate in left populist circles. Other left movements, such as the ‘Five Star’ party of Italy’s Beppe Grillo, which had significant electoral success in previous Italian elections favour radically consolidating the existing political system. Meanwhile, other rightwing populist parties are emerging such as AfD (Alternative for Germany) which requests an orderly breakup of the euro, arguing that Germany needs the euro, while other countries - especially in Europe’s south – will be directly harmed by their continued membership. This party requires the return to national currencies or the creation of smaller and more stable monetary unions, considering that the reintroduction of the mark should no longer be held to be taboo as an idea. This view, however, is not that of mainstream right-wing populism in Europe. For example, the ‘Austrian Freedom Party’ (FPÖ), which since 1986 has relentlessly criticized the Austrian Republic, is not seeking a return to Austrian currency. Instead, it calls for the removal of heavily indebted southern countries from the euro, whatever the negative fallout from this. According to the FPÖ, rising unemployment in southern Europe is the direct result of the refusal of the Eurocrats to expel unsuitable countries from the euro. Despite the wide gulf between such populist right-wing arguments and the critique of Lafontaine, there is a common reference point in the explicit and outright opposition to the direction taken by national governments and the European Union. Lafontaine explicitly positions himself against the interests of the German associations of businessmen and industrialists and cooperates with the neoliberal bloc party consisting of CDU / CSU, SPD, FDP and Greens. The ‘Alternative for Germany’ (AfD) believes that the old parties are “eroded and fossilized” because they refuse to “admit their mistakes and errors of omission”. For the ‘Austrian Freedom Party’, the “eurocrats of Brussels” are directly responsible for the crisis, alongside incompetent Austrian politicians. Confrontational statements and heightened rhetoric make an appeal to the people to stop supporting current government schemes and seek an alternative to the managerial solutions proposed by the incumbents. They call for a significant shift, either to left or populist right, an effective political ploy in irrigating votes from large disaffected sections of the populations across Europe. Populists, however, must pay a price for this kind of mobilization. Populists argue that they are able to better represent the collectivity than existing governments. They claim that the people’s “will” and the political “will” of the populists are identical. Many use the phrase: “we are here for you”. The price is that they must necessarily invoke a more or less unified national collectivity as their target. Lafontaine for example repeatedly uses phrases that focus on the “Germans” as a national entity with specific national interests, while the AfD forthrightly argues that the “Euro is not necessary for Germany”. The FPÖ requests “Austria to be your first choice”. Therefore, populism as an ideology can only operate according to a romantic notion of the “homogeneous people”. This “homogeneous people” is all that stands against the “capital of foreign imperialist interests” of “foreign agents” of “Merkelists”, and also against the emigre, the foreigner and the unknown. This is essentially a stand against equality and subsequently, against progress. In its modern trend, populism is characterized by a national logic embedded in a western European identity. This is the reason why European right-wing parties that are members of the European Parliament are in such close collaboration. It is quite obvious that there is no single collective “will” of the people in modern democracies, as modern democracies are characterized by a plurality and diversity which may attempt to organize itself, especially, for example, on the side of the left, but which cannot be collectivized. There are some additional features of these populist movements: often the presence of a charismatic leader, the use of a particular range of propaganda techniques (conspiracy theories, enemy images, a preference for radical solutions, iconoclastic challenges to any taboos). Left populism may have a role to play as a necessary species of demagoguery, in mobilising and provoking the masses at a time when the media plays such an important role in public discourse. But what cannot just be ignored is the vigorous exclusionary line of thinking in much populist discourse. This acts through a systematic appeal to the category of “we”. “We” the Greeks, “we” the Austrians “we” the French, and our putative common interests, opinions and culture. Populist narratives produce and form imagined communities that are usually pitched against a foreign encroacher, which must raise the question for left populists of whether it is ever worth paying the price of sacrificing “foreigners”, the “new” and finally, the whole world outside in all its difference, for the sake of such leftwing populist mobilisation. However, populism also has some positive effects - such as the increased pressures on the established parties to find solutions to key problems that can channel the emotions and diffuse people’s discontent into safer political territory. The potential danger of populist movements is that they infect mainstream political discourse, trivializing issues and legitimizing anti-pluralist trends. The best way to deal with them is to solve the problems they thrive on, which requires tolerance and not the one-dimensional perspective of austerity as imposed by the Troika in Greece. If someone expects positive results from the current Greek political elite, including the current Greek opposition, then we can only wish them patience.